Leadership principles are much easier to define than they are to practice! I have discovered this the hard way as I have been on my journey as a leader. I have read numerous books on leadership, both from the business and the ministry world. I have taught seminars on leadership. But, I have discovered the one constant is that it takes a long time to become a great leader! This is the first of 28 leadership principles found in the book, Moses on Leadership: How to Become a Great Leader in Forty Short Years, by Dr. Gene Mims. These 28 principles of leadership are used by Dr. Mims in his book, Moses on Leadership, to take us on Moses' journey toward becoming a great leader. It takes a long time to become a great leader. Personal failures do not mean the end our our leadership. God never calls us to anything small or insignificant. God is constantly working in the world to establish His purposes and He works through leaders to accomplish these purpose. God's call is usually to something that is beyond our background, experience, training, skill, education, and comfort level. A person's age does not determine what God can do through him or her. God's call comes with His power and authority which He gives us to exercise. Great leaders get better by listening to wisdom and truth from others. Great leaders do not give up on their people. Great leaders teach to transform people. You cannot lead people where you have not gone or are unwilling to go. Choose persons to help you wisely. If you must, choose character over skills. Whatever God has called you to, you can do with the people you have right now. Your skills may take you where your character cannot keep you. Godly character cannot be defeated. Great leaders do what God wants, teach what they learn from Him, go where He sends, and do not initiate anything without His permission. The way a leader speaks about people, especially his parents, reveals much about his character. Great leaders are and remain sexually pure. Great leaders do not lie, ever. Great leaders are humble and persistent. Great leaders communicate clear messages over and over and over . . .
Great leaders meet opposition with strength of character and the power of their calling and vision. Time alone with the Lord is the key to good relationships. Most of a leader's problems are people problems. You cannot reach the delights of your vision until you meet the demands of your problems. Great leaders do the difficult task of developing visions and strategies and the tedious work of handling the details of work that needs to be done. Great leaders have the privilege of building great friendships without compromising their role of working with God to build His Kingdom. Your calling is often what keeps you in the ministry God has for you when everything around you screams for you to quit and run away. "I am a pastor having served in ministry for over forty years. I have made many, many mistakes as a leader; some from ignorance, some from pride, some from inexperience, and many from haste. One mistake I hope to avoid for the years that I have left as a Kingdom leaders is the mistake of not developing as a leader. 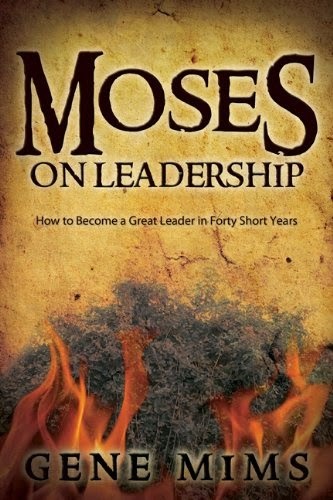 Moses encourages me to keep leading, learning, and developing." Dr. Gene Mims currently serves as the Senior Pastor of Judson Baptist Church, Nashville, Tennessee. He is an author, speaker, and member of the 4:12 Network. You can learn more about Dr. Mims at www.genemims.com.